Normally when someone finds your lost wallet it's good news. Not so for a Fairfax County man. 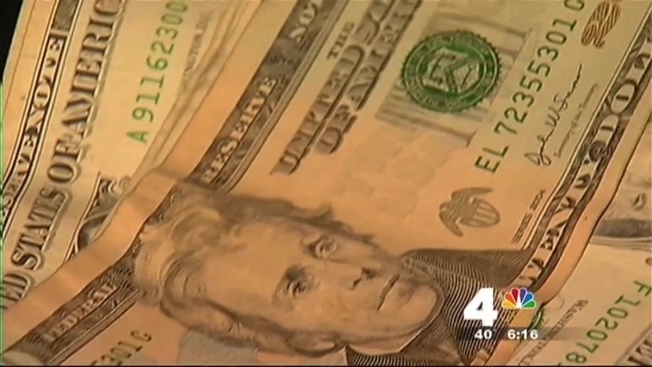 The wallet found and turned over to police contained more than $700 in counterfeit bills. Now, 24-year-old Brian Bogan faces felony charges for both possessing and making fake money. A search warrant document filed in Fairfax County court shows Bogan's undoing came when he left his wallet behind after dining at Alexandria's Hotel Monaco on Thanksgiving Day. Hotel staffers say a guest sitting in the lobby found the wallet and brought it to the front desk. Alexandria Police were called and the officer who arrived noticed right away the wallet was jammed with funny money, $720 worth. Documents say an officer found an ID in the wallet and called Brian Bogan. Once at the hotel, court documents say Bogan told the officer he had so much money because he'd been selling gift cards. Bogan was then placed under arrest. Hotel staffers tell News4 it appeared to them some of the bills didn't even have printing on both sides. Police also talked to Bogan's father who reported three packages addressed to his son had recently arrived at his home. The search warrant affidavit says Bogan's father thought the boxes contained what appeared to be counterfeit money. Documents say he asked his son about the bills but Bogan denied doing anything wrong. When police searched the apartment, they seized nearly $10,000 in counterfeit money, credit cards and printing and scanning equipment. "You don't usually deal with counterfeit currency in this high amount," Alexandria Police Department spokeswoman Crystal Nosal said. "There was a lot of money involved, or a lot of fake money involved." Bogan has been released from the Alexandria Detention Center after relatives posted $10,000 bond.